Close your eyes and taste a bite of my freshly picked cantaloupe, grown in my own vegetable garden. It is as good as it looks, and reminds me of my grandparents who always seemed to have cantaloupe with their breakfast. I’ll also enjoy mine for breakfast tomorrow morning and I'll take some to work for lunch and give some to my neighbor. There are several more in my patch that will ripen in the next few days, hopefully just a few at a time. I’m often asked what I do with all the produce that I harvest from my garden. The answer is, of course, “it depends”. Some I eat, some I give away, a tiny bit I freeze for winter, and some gets overgrown and ends up in the compost bin. It mostly depends on how busy I am. Last night I made some fresh salsa with Jalapeno and Serrano peppers, along with some ‘San Marzano’ tomatoes and onions from the garden. Then today I took the rest of the peppers to work where I found many willing takers. The night before, I breaded and fried some eggplant and had it as part of my supper. It’s one of my favorite cooked vegetables, but I usually have it just once a year, maybe twice. Two nights ago, I ate fresh cooked green beans and sweet corn. And at every meal, at least for now until they stop producing, I eat fresh tomatoes. Yes, that includes breakfast. I like to eat fresh tomatoes with scrambled eggs. Somehow, all the vegetables I grow get eaten or shared, for the most part, though I am worried that the dozen squash on the kitchen table are starting to “turn” on me because I haven’t done anything with them yet. What does everyone else do with all their harvest? 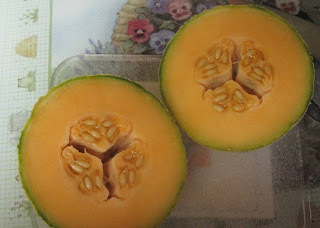 I just harvested two of my cantaloupes today. Ate half of one and then cleaned the seeds to prepare them for drying out! Nothing like these babies in the grocery store! This is going to sound silly, but the thing we do the absolute most with our harvest is admire it. Our family is so pleased. Even when I show our children vegetables such as tomatoes that 2 of them refuse to eat, they are proud. Of course, we eat it too. Today we pickled green beans and had hamburgers with fresh tomatoes. Last year we dehydrated summer squash and it works great in soups and sauces. Oh yumm, you are making me hungry. I am one of those that are standing in line drooling hoping that someone will share their harvest. The only overabundance we seem to have is in jalapeno peppers. We give some away, and some we freeze, some we eat fresh in burritos or in nachos, and some we put into the jar of pickled jalapenos. All the Bell peppers will be eaten, either raw or roasted. We eat, eat, eat as much as we can. I share some, but mostly our garden is a provider for us all year round. I make tomato puree and can it (36 pints so far). We roast zucchini and eggplant and save it for future use. We freeze asparagus, green beans, peas, greens (like chard and kale). I make pickles from cucumbers and beets. We slice and dehydrate carrots. The onions and potatoes and garlic live in the root cellar until needed. We make wine with the grapes from the vineyard. When I have fruit, I freeze it for smoothies. This includes melons. I scoop them out of their shells, puree them in the blender and freeze the puree in half pint quantities. I pop those out of their containers and store them in the freezer in gallon zip lock bags, and they make absolutely delicious smoothies for breakfast when we can enjoy this wonderful taste of summer when the snow is on the ground. We get very busy during the summer with all this process, but Jim helps (A LOT) and I work from home so we have time. Also, I don't have to earn the money to buy all that stuff all winter, so I don't have to put in so many hours. It evens out. Plus I know what is in what I am eating, which is important to me. At our house, we eat our veggies, or give some away, and sometimes even take it down to the city's soup kitchen. They will accept summer veggies from gardeners. We love the meals that come from the garden--potatoes, greenbeans, squash,tomatoes and cukes. Like your grandma and granpa, we eat Cantaloupe about every morning along with peaches, cherries, blueberries and whatever fruit we buy. I've given some of my extra pole beans, blueberries and eggs to the local food pantry. We have been promoting the Plant a Row for the Hungry Project instituted by the Garden Writers Association in 1995. The food pantry does not mind getting the small amounts of produce that you might share with a neighbor. I cut the cantaloupes up into pieces and put it on the top shelf of the fridge where my teenage boy can't miss it. Cuts down the open fridge door time since he just grabs it and pigs out after footbal practice. I think we enjoy our produce so much more knowing that it's only here for a limited time. Yes, you can buy a canteloupe at the grocery store in January (I once saw one once marked at $88 at a gift shop in Tokyo!) but the "limited time only" label makes it taste better somehow. We seem to have grown the perfect amount for our family this year -only gave away a few cukes and zukes. Lucky you. I remember the year we had cantaloupes coming out of the........ I even made cantaloupe granite. Not this year though. Sharing is one of the best things about gardening. I took a bag of tomatoes to work yesterday and when I told people where they were, the entire department got up to get some, everyone walking back with handfuls. Love it! I'm trying to freeze more for myself this year, too. My mom has a dehydrator, and a basement room cold enough for root vegetable and squash storage. Potatoes are stored in sand and they last longer. Dehydrated tomatoes make fantastic pasta sauces. No endless boiling required to thicken, and the flavor of the sauces is truly remarkable. It's worth the cost of a dehydrator for the tomatoes alone. Mom dehydrates other veggies too, and fruits, and surplus morels that grow in her woods. Then she vacuum seals them in mason jars. I steam or roast squash and pumpkins, then puree or mash, vacuum seal and freeze it in measured portions of one or two cups per package - perfect for breads, pies, soups, or simply prepared, either plain or with seasonings and butter, and served with a winter supper. Preserved garden veggies are comfort food at its finest during the winter months. What we don't eat or share, we're freezing to enjoy this winter. There's something about enjoying good berries in the dead of winter!